A late arrival for 1957 was "the ultra-smart" Golden Hawk 400, appearing in time for the spring selling season. Studebaker's finest car that year, it is unquestionably the rarest model of this generation. Priced nearly $500 above the standard Golden Hawk, the 400 featured hand-buffed top-grain leather upholstery in white or tan. If the car was two-toned -- and most were -- the air intake ports flanking the grille were painted to match the contrasting color on the fins' concave surfaces. Although exact production has yet to be established even now, it is thought only 200-300 of these cars were completed. 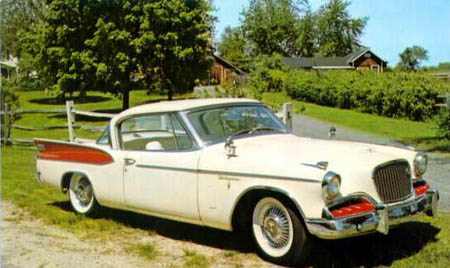 Studebaker only made about 43 Golden Hawk 400's. The number varies, depending on who you talk to. Tom Lawless in South Bend has the full information. He knows how many were made, what the serial numbers are and how many are left. Only 9 are known to exist now. He wrote an article in Turning Wheels a few years ago, about them.